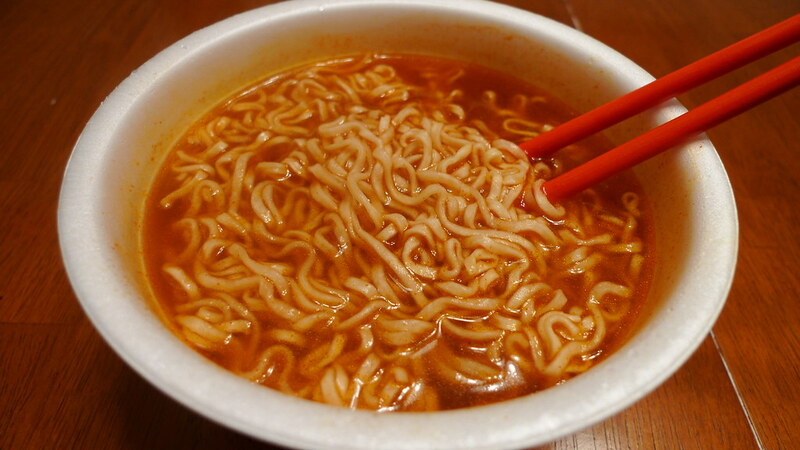 Shirakiku's Goku-uma Ramen-Noodles - Hot Flavor. 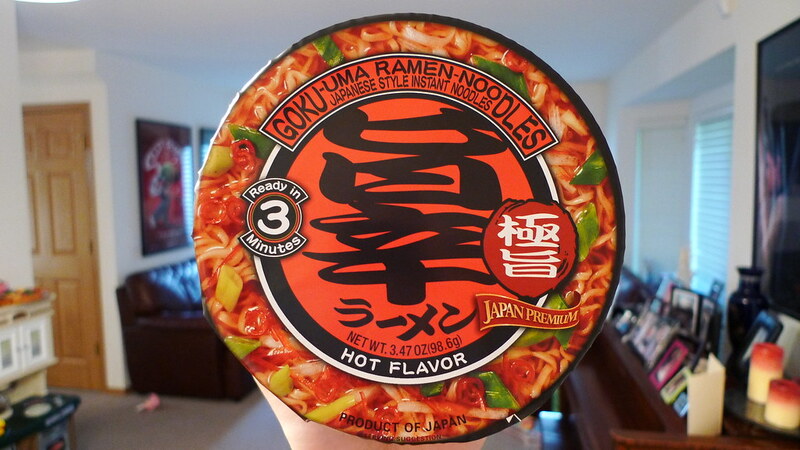 I have never seen or heard of Goku-uma Ramen-Noodles before. I picked it up because it was on sale. There were three flavors available when I went: a seafood flavor, a hot flavor, and a soy sauce (shōyu) flavor. I went with the hot one since I love spicy things. Did I regret it? Read on to find out. I could not find out much about Goku-uma. 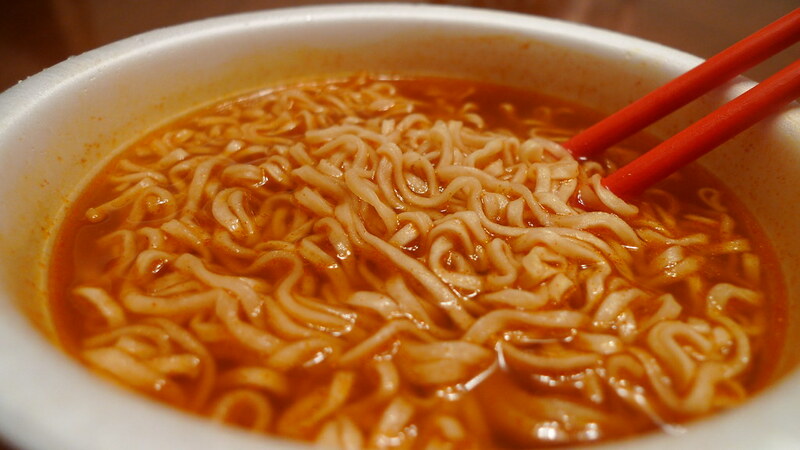 It is a product of Japan made by the brand name Shirakiku. From what I can tell, Shirakiku makes a variety of other foods in Japan, including Ramune soda, which I mentioned in a review last week. Brand names and products can get pretty confusing. 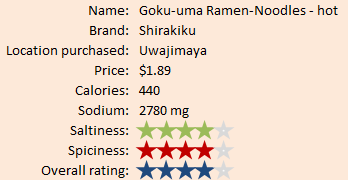 Goku-uma is distributed by Nishimoto Trading Co., Ltd. in Sante Fe Springs, California. 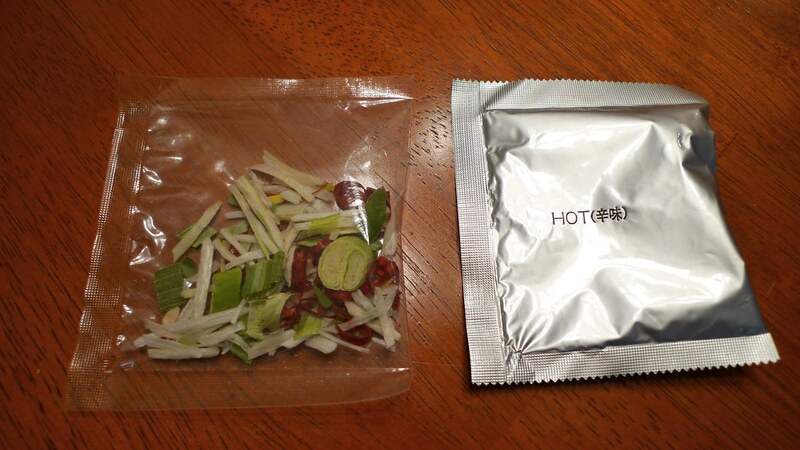 The two packets you get inside the Goku-uma bowl noodle. 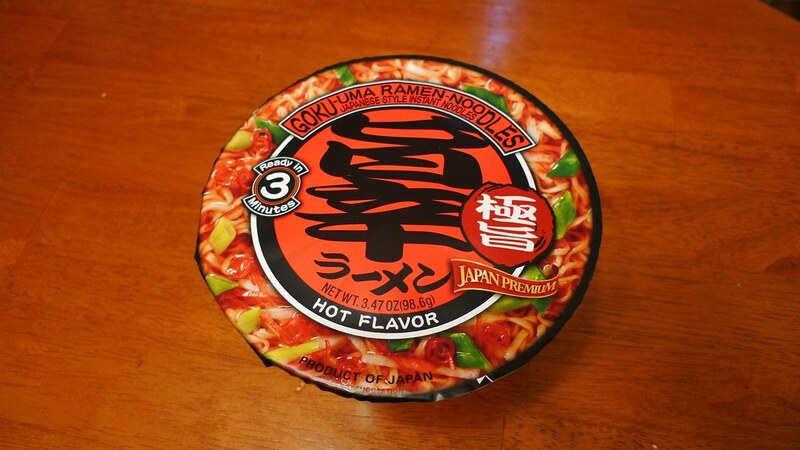 The packaging of Goku-uma Ramen-Noodles is bright and attractive. This is especially so with the red in the hot flavor. 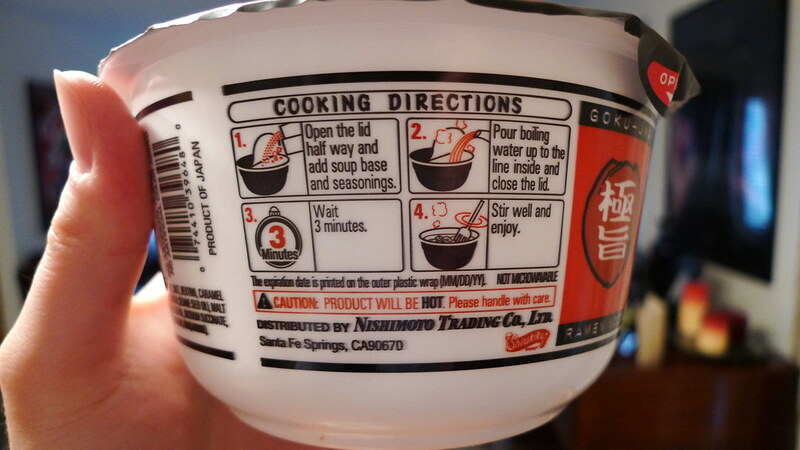 The bowl itself is made of styrofoam and has easy-to-read instructions and nutritional information on the side. 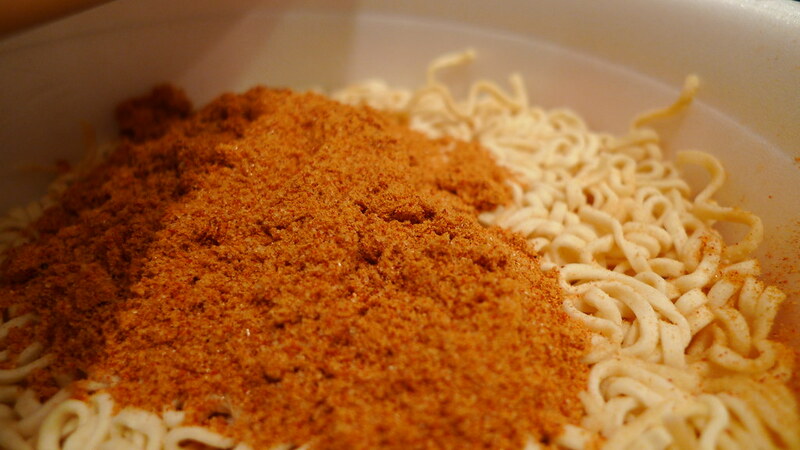 Seasoning added to the noodles before the boiling water is put in. 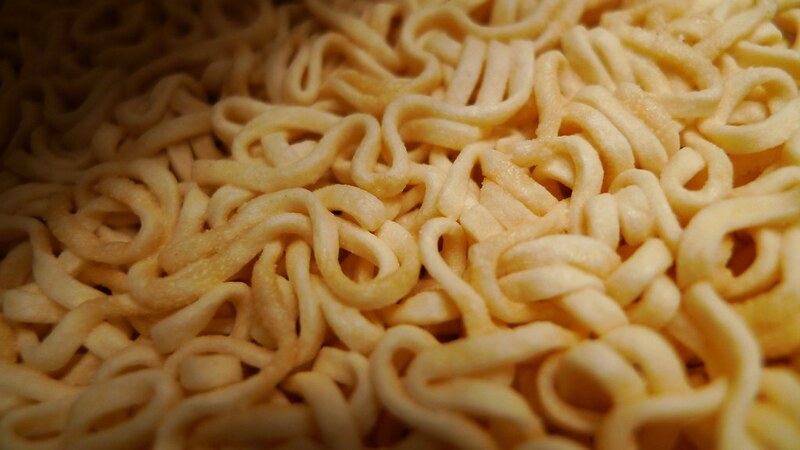 The noodles were curly like Top Ramen. I would say they were the same shape as well. Goku-uma comes with a seasoning packet and dried vegetables. The seasoning was very red. The dried vegetables only included green onion and red pepper, so you may want to add extra veggies to this thing. I liked the broth quite a bit. It was spicy and had a slight kimchi and garlic flavor. It was, however, a bit salty. Maybe a little too much. Julie had to skip this one because it was spicy, but I really liked it. I think I liked it just as much as Nong Shim's Bowl Noodle Soup. I love trying new things and liking them. 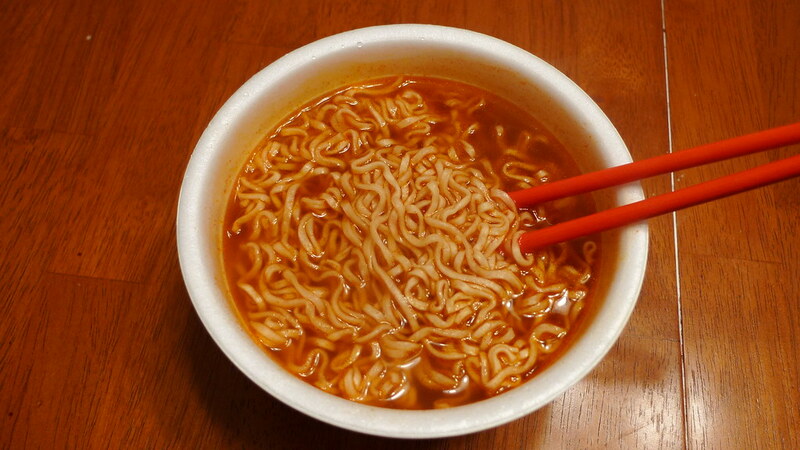 The only downside is the price ($1.89), which isn't terrible, but certainly not as cheap as Bowl Noodle Soup (70 cents). I would buy this a few times a year.